The Light Box has been a very popular APH product for many years and it has recently been revised to be both lighter and brighter! The Mini-Lite Box is also available as a smaller, lighter and more affordable option. The high contrast background provided by a light box's illuminated surface makes a variety of visual tasks easier to perform. No matter which light box you choose to use, APH has developed many visually stimulating materials that can be used in conjunction with it. Three different levels of Light Box Material sets can be obtained using federal quota funds. Light Box Materials: Level I is the first of three sets of teaching materials for use with APH's Light Box. The materials in this set help teach basic visual skills, eye-hand coordination, and simple matching skills and is focused on ages birth though four. Level I Includes many brightly colored solid and patterned overlays designed to stimulate awareness of light, patterns, and objects; a spinner with two different patterns that encourages localization and reaching; a variety of transparent and translucent colored and opaque items for practice in eye-hand coordination and matching; and suction-cup handles for manipulation of small pieces. 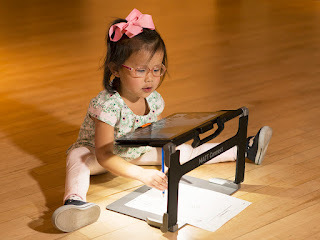 Light Box Materials: Level II is focused at ages three through five-years-old and helps in teaching matching and identification skills, part-whole relationships, sequencing, pattern duplication, spatial relationships, and visual memory skills. Level II contains over 400 items including brightly-colored transparent and translucent shapes, pictured objects, stencils, cutouts, worksheets, a blackout background sheet, and a clear nonslip work surface sheet. Light Box Materials: Level III is focused on ages five and up and helps students develop prewriting and handwriting, more complex matching and sorting, recognition and identification, spatial relationships, visual memory, sequencing, figure-ground discrimination, visual closure, and part-whole relationships. Level III includes over 400 items including dozens of picture and letter cards, five types of game trays, a blackout background sheet, and a clear nonslip work surface sheet. Each of the kits come in a carrying bag with an accompanying guidebook that contains over 90 activities that can be performed using the materials specific to that kit. The large print and Spanish edition Light Box Activity Guides for levels one, two, and three are available as free-of-charge file downloads from our downloadable manuals page at http://www.aph.org/manuals/index.html.